This full size accordion has 41 treble keys and 120 basses. There are 4 sets of treble reeds and 5 sets of bass reeds; including 11 treble switches plus master and 5 bass switches. Available in musette or piccolo tuning. 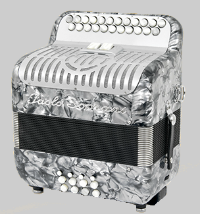 An accordion with some character, this fully decorated model comes complete with the traditional eagle grill. 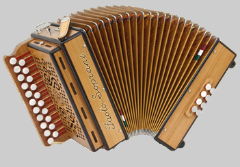 As a full size piano accordion, it has 41 treble keys and 120 basses. There are 4 sets of treble reeds and 5 sets of bass reeds; including 11 treble switches plus master and 5 bass switches. Those interested in a compact piano accordion with a unique wood finish, look no further. 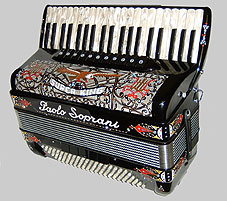 This accordion has 34 treble keys and 96 basses. There are 3 sets of treble reeds and 4 sets of bass reeds, including 5 treble switches plus master and 3 bass switches. The Super Paolo has been Paolo Soprani's top model for many years and for good reason. This piano accordion has 41 treble keys and 120 basses. There are 4 sets of treble reeds and 5 sets of bass reeds; including 13 treble switches plus master and 7 bass switches. Hand made reeds available. The chromatic system is argued by many to be superior. 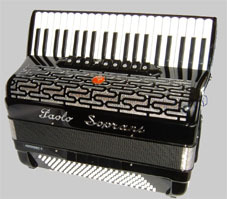 This accordion has 87 treble buttons in a 5 row stepped keyboard and 120 basses. There are 4 sets of treble reeds and 5 sets of bass reeds; including 9 treble switches plus master and 3 bass switches. Available in both C and B systems. The name says it all. 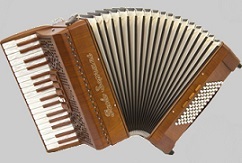 This diatonic accordion has 23 treble buttons in 2 rows and 8 basses. There are 4 sets of treble reeds and 4 sets of bass reeds; including 2 treble switches. Available in a variety of key combinations. Size: 31cm x 18cm x 32cm. Weight 5 kg. An old model made new again. 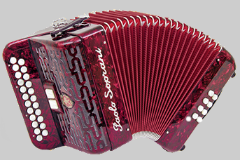 This diatonic accordion has 23 treble buttons in 2 rows and 8 basses. There are 4 sets of treble reeds and 4 sets of bass reeds; including 2 treble switches and 2 bass switches. Available in a variety of key combinations. Size: 31cm x 18cm x 32cm. Weight 5 kg. The Saltarello 8 conveys the traditional style that Paolo Soprani is known for. 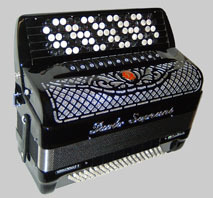 This diatonic accordion has 21 treble buttons in 2 rows and 8 basses. There are 3 sets of treble reeds with a single voice changer. Available in a variety of key combinations. Size: 27cm x 16cm x 27cm. Weight 2.9 kg. Shown here with an attractive wood finish. The Saltarello can also be decorated to create a stunning appearance. This diatonic accordion has 12 treble buttons and 2 basses. There are 3 sets of treble reeds with a single voice changer. Available in a variety of key combinations. Size: 25cm x 13cm x 27cm. Weight 2.3 kg. Paolo Soprani models will only be ordered and stocked upon customer request.